To create the perfect all-rounder the ingredients are simple: take one of the best super-nakeds around and add soft panniers, a comfortable seat, hand guards, a GPS mount, a taller screen and a quickshifter. The MT-10 Tourer Edition is the result and it’s been an instant success, beating off some stiff competition along the way. During the summer we headed to the west coast of Scotland and pitched the Yamaha against a variety of different-sized and priced tourers: the Yamaha FJR1300 and Tracer 900, BMW S1000XR and Suzuki GSX-S1000F. None could match the MT’s enviable mix of laugh-out-loud fun and high-mileage practicality. I first rode the new machine at the start of the year at its launch in South Africa and was blown away by how easy it was to use, its simplicity, classy engine, handling, all-day comfort and wallet-friendly value for money. In its transformation from super naked to sports tourer, Yamaha left its R1-derived crossplane crank engine alone, so it makes the same silky smooth 160bhp and 81.87ftlb of torque. Packed full of usable grunt and with an intoxicating MotoGP soundtrack, theYZR-M1-inspired motor is one of the finest on the market. Power and torque come cascading in with every millimetre of throttle and it’s easy to keep the engine on the boil thanks to its brilliant quickshifter, pinched from the current R1. Rider aids are also kept from the MT-10, so you get three power modes with varying levels of throttle response, ABS and traction control, which can be changed on the move and deactivated completely at a standstill, so you can have some fun. Although the rider aids aren’t as sophisticated as the ones you’ll find on the R1, they still work brilliantly. Traction control will save you in a slide, but won’t stop you from pulling wheelies (like many nanny-state systems), which the MT-10 was born to do. The Yamaha demolishes corners with poise and confidence, but its genius is the way it morphs into a smooth, composed, comfortable, friendly long distance companion, which doesn’t suffer vibrations and won’t give you knee, back or wrist ache. There aren’t many chinks in the Yamaha’s armour, but the fuel range from the 17-litre tank can be a problem on long trips. The crossplane engine has always had a craving for unleaded and the fuel light comes on at anything from 120. That aside the MT-10 Tourer Edition is a perfectly-formed, exceptional-value sports touring bike. Yamaha’s naked MT range was literally a life-saver for the Japanese firm. 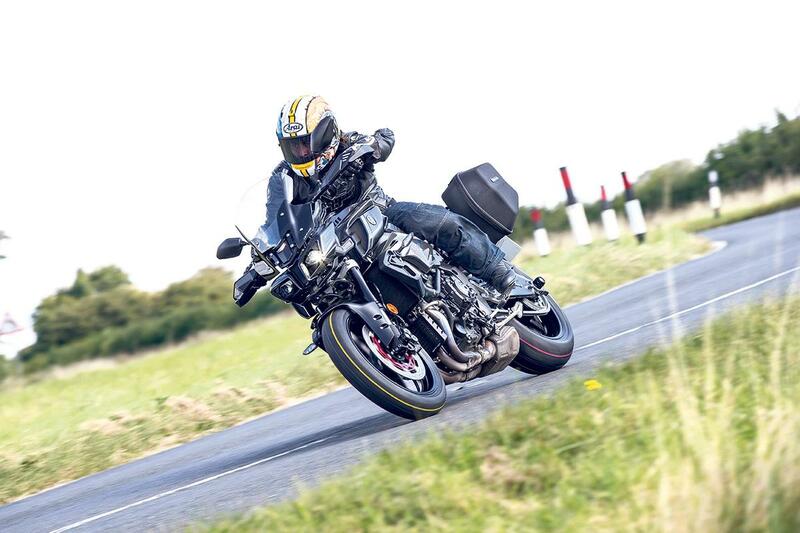 First came the rasping, but slightly troubled, three-cylinder MT-09 and hot on its heels was the multi-MCN award winning MT-07 twin. But last year came the cherry on top and we all bowed down and prayed to the sensational, R1-engined MT-10. While Yamaha produced official touring MT-07 and MT-09 Tracer editions the Japanese firm said there’d never be an MT-10 version… so we decided to make our own. At the end of last year took an MT-10, loaded it with over two and-a-half grand’s worth of official Yamaha touring accessories and took it to the Nürburgring alongside an Aprilia Caponord, BMW K1600GTL, Kawasaki ZZR1400 and a KTM 1290 Super Duke GT. Together with guest tester, F1 legend Martin Brundle, we wanted to see if our home-made Yamaha could be the most fun tourer around. It was. And now for 2017 is this MT-10 Tourer Edition. It’s a Tracer by any other name and the same as the bike we created ourselves for ourRing adventure. Did MCN inspire it, or had Yamaha planned it all along?Who knows…but we’ll take the credit, anyway.